Description: The upper areas of the Douglas Squirrel's body is either reddish gray or brownish gray. This color eventually fades into chestnut-brown on the middle of the squirrel's back. The squirrel turns into a grayer shade in winter. During the summer it has a blackish line on its sides, which becomes indistinct the rest of the year. The Douglas Squirrel also has small ear tufts in the winter. Photo courtesy of Franco Folini. Size: The Douglas Squirrel is approximately 10.5 - 14 inches in length including its bushy tail that is 5-7 inches in length. Range / Habitat: The Douglas Squirrel lives in the coniferous forests of North America's west coast. It wanders playfully throughout all parts of the forest and treetops, but prefers lingering close to the forest grounds. This squirrel is very active throughout the year, and it runs about through trees and on the ground. Its nature prevents the squirrel from wandering outside when the weather turns nasty. Photo courtesy of Walter Siegmund. The Douglas Squirrel uses both a summer and winter nests. Its summer nest is built mostly of mosses and lichens, twigs, and shredded bark. Diet: Douglas squirrels live on seeds from trees like the Douglas Fir, Sitka Spruce, Shore Pine and other conifer cones by peeling off each scale, discarding the scale and removing the seed. They will also harvest green cones and nuts (such as beaked hazelnut) and hide them in mid to late summer in preparation for winter. They will hide these in random places throughout the forest to eat later. 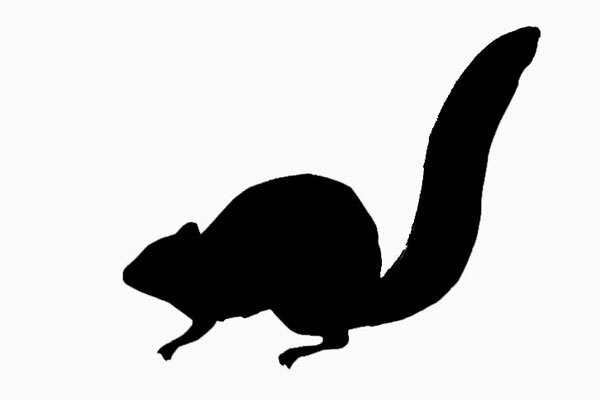 Behavior: The Douglas Squirrel is the noisiest squirrel, and has a huge range of calls. He uses his calls to warn other animals in the forest of dangers and approaching predators. The discarded scales from the cones they eat pile up over time and create what is called a "midden". Sometimes generations of squirrels use these same eating areas and a midden may be over a meter high and several meters in diameter. These are sure signs that a squirrel lives nearby.